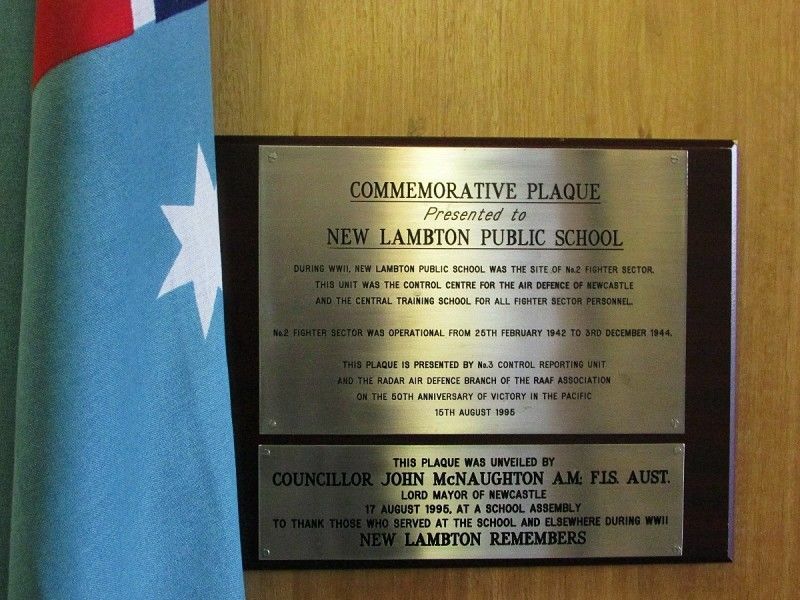 Two plaques were presented to the school on the 50th anniversary of Victory in the Pacific and commemorates that the school was used as the site for No.2 Fighter Sector during World War Two. 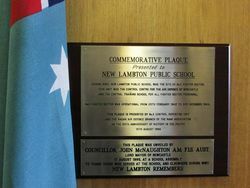 New Lambton Public School was requisitioned by the government for military use during World War Two and became Nº2 Fighter Sector Headquarters. The unit that took up residence at the school was known as Nº2 Fighter Sector (FS). This unit was responsible for fighter aircraft control and coordination for the Newcastle region and was set up on 25 February 1942. Squadron Leader M.H. Everest was the first Commanding Officer and the principal aircraft controller. 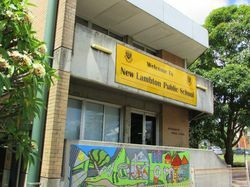 Pupils were sent to neighbouring schools. During WW2 , New Lambton was the site of No 2 Fighter Sector. This unit was the control centre for the air defence of Newcastle and the Central Training School for all Fighter Sectors personnel. No. 02 Fighter Sector was operational from 25th February 1942 to 3rd December 1944. This plaque is presented by No. 03 Control Reporting Unit and the Radar Air Defence Branch of the RAAF Association in the 50th Anniversary of Victory in the Pacific.